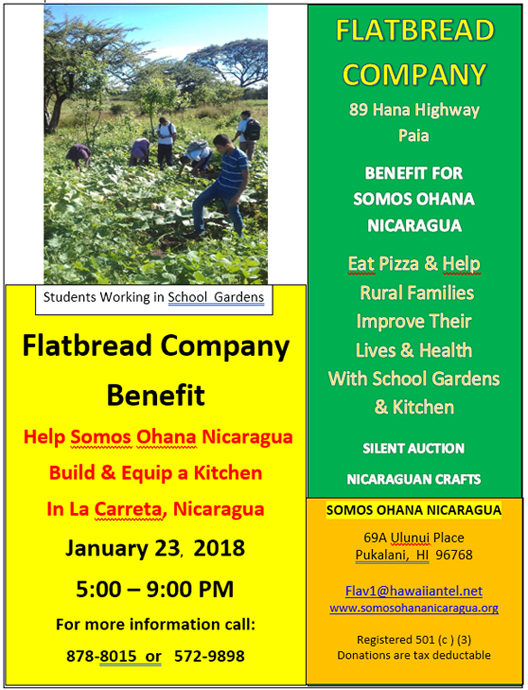 Somos Ohana Nicaragua, a local non-profit group that builds schools and brings physical therapy services and scholarships to northwestern Nicaragua, will hold a fundraiser at The Flatbread Company in Paia on Tuesday, January 23, to raise money for building the much-needed 3rd wing of the most recent secondary school the group has constructed. The pizza night fundraiser includes a sale of Nicaraguan crafts and a silent auction with many valuable prizes. A portion of the money from every pizza sold at the restaurant between 5:00 and 9:00 pm will be donated by The Flatbread Co. to Somos Ohana Nicaragua. Volunteers of the Pukalani-based non-profit are preparing for their 19th consecutive summer of working with the people of small villages in the municipality of Villanueva, Department of Chinandega. The group’s president Charlotte Flavin stated, “The well to supply water for the school is ready to be drilled. Now we can begin work this year on the third wing for Instituto Augusto Cesar Sandino, which will include a kitchen so that students can clean and prepare the vegetables for sale that will be grown in the school gardens.” One hundred thirty-three students from remote and underserved rural communities completed their first full year of classes at the school and are on break, with the second academic year in the school’s history to begin in February. Somos Ohana Nicaragua has worked alongside communities in the past to build another high school, an elementary school and two pre-schools, to renovate elementary schools and to complete two water systems. They also hold an annual 2-week summer camp for children and young adults with special needs. The group has provided over 120 bicycles for teens that previously walked 1 to 2 hours to their high school. They assist with partial scholarships for 6 university students who are majoring in health and education fields, and they provide a travel fund for cancer patients to get to a city center for medical treatments. Volunteers with skills to share and the desire to help are always welcome to work with the organization. Spanish language ability, while desirable, is not necessary. A free weekly Spanish class is offered in Pukalani for people planning to go with the group. Volunteers pay their own way to the Central American country and pay a modest daily fee to the families they board with. Somos Ohana Nicaragua (www.somosohananicaragua.org) can be contacted at 572-9898 or 878-8015. Please friend us on Facebook at Somosohana Nicaragua.